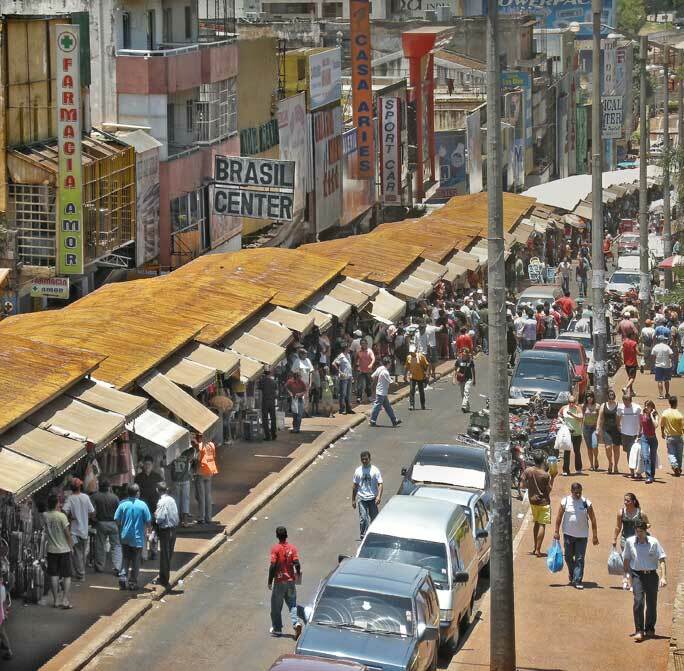 The main strip in Ciudad del Este. Miles of stalls selling name brand knock-offs, pirated goods, and plastic junk. Paraguay is Latin America’s least-visited country. Travellers seem almost to make a point of avoiding it. Possibly, it’s because of geography–a quick glance at a map will confirm that Paraguay’s borders reach neither the mountains nor the coast. Or perhaps it’s because of Paraguay’s history of dictatorships. Well, what Latin American country doesn’t have that history? Personally, I think it has to do with marketing. Paraguay simply hasn’t sold itself as a travel destination, though I think it could easily–it’s one of the most beautiful and rewarding countries I’ve toured. Initially, however, I wasn’t so sure. 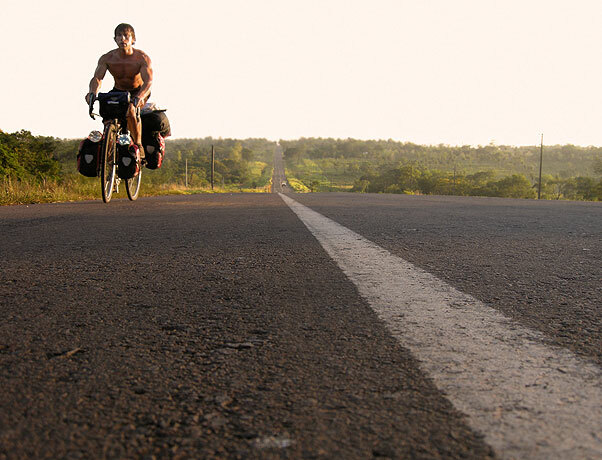 When I first crossed the border at Ciudad del Este I was worried I’d made a big mistake attempting to tour Paraguay. Flying garbage, black exhaust clouds, relentless car horns, relentless heat, constant yelling, thousands of cramped stalls selling name brand knock-offs, roaming junk hawkers, scabby dogs, guys with shotguns and Kevlar vests everywhere–this was my first view of Paraguay. But despite this discouraging introduction, I soon discovered that people were very friendly and very helpful; even the ones holding shotguns. Saltos del Monday, near Ciudad del Este. 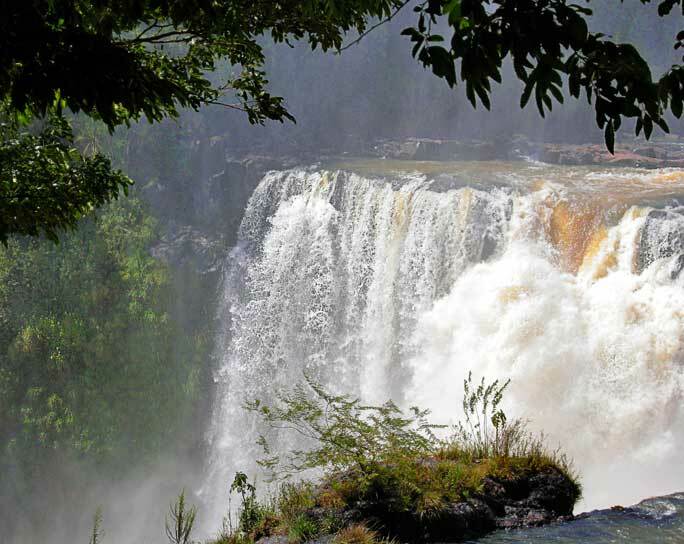 If there’s one thing you should see in while you’re in Ciudad del Este it’s the nearby waterfalls, Saltos del Monday. They’re only 8 km south of the city and relatively easy to find (although in order to get there you must first survive 5 km of nasty traffic and pollution). The falls may not be as impressive as Iguazú, but unlike Iguazú you’ll have the entire park to yourself and it’s an excellent spot to escape the mayhem of Ciudad del Este for a few hours. The major cities of Asunción, Ciudad del Este, and Encarnación form a triangle in the south of Paraguay. This is where most Paraguayans live and where you can visit those Jesuit Mission ruins you’ve been reading about in your guidebook. Outside city limits, Paraguay is a quiet place. Well, that is until you get to the Chaco, where the insect and bird noises can reach near-deafening levels. The Río Paraguay runs north to south, dividing the country into two overlapping flanks. The eastern flank (where all the major cities are) is mostly flat-to-rolling farmland that becomes gradually hillier and more forested to the north; it’s pleasant enough and there are plenty of places to find provisions. 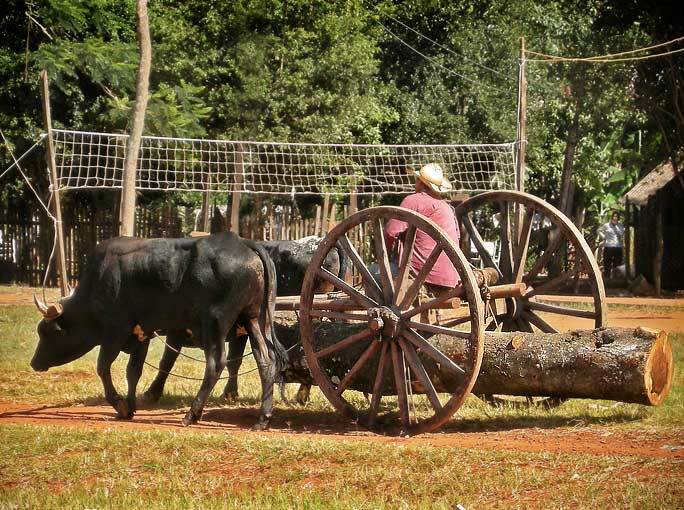 Oxen in rural Paraguay march shoulder to shoulder hauling a massive tree trunk attached to two enormous wheels. Volleyball nets hang in front of many of the houses. Volleyball, I’m told, is Paraguay’s second most popular sport after (you guessed it) soccer. Oxen pulling a giant-wheeled “alzaprima” with a volleyball net in the background – two common sights in rural Paraguay. Paraguay’s western flank is mostly taken up by a vast area known as the Chaco, or Gran Chaco, that also stretches into neighbouring Argentina and Bolivia. The Chaco is divided climatically into the Chaco Húmedo (Humid Chaco), roughly south and east, and the Chaco Seco (Dry Chaco), which is more north and west. Touring the Chaco is like riding through an enormous zoo exhibit. Every morning the forest echoes with the shrieks and howls of a billion birds. Silvery centipedes march across the road. Giant stick insects hang from twigs. Anteaters shuffle through bushes looking for snacks. And then there are bigger animals. Paraguay is the only place I’ve ever seen a wild jaguar. I was riding before dawn to get ahead of the heat along a straight stretch of road that cut through a swampy, forested area. In the pre-dawn light I saw an animal on the road in the distance which I assumed to be a dog. As I pedalled along, observing all the bird activity either side of me, it occurred to me that it didn’t make sense for a dog to be in a wild area, far from any village. Nagged by this thought, I looked back up the road and saw that the “dog” was really a jaguar picking away at some road kill. Instantly, I skidded to a halt causing the jaguar to look up at me. I’m not sure how long we stood there, staring at each other, but eventually it leapt off the road into the forest in one big, beautiful movement and I felt both thrilled and relieved. Thrilled because I couldn’t believe my luck in seeing a wild jaguar and relieved because I had absolutely no idea what I would’ve done had it approached me. Riding in the early morning to stay ahead of the heat in the Chaco Húmedo. Paraguay can get very hot. People drink their mate cold here (they call it tereré). When I toured the Chaco, daytime temperatures rarely dropped below 40ºC (104ºF). I would get all my riding done before 10 o’clock each morning, at which point I would try to find somewhere shady to hang out for the rest of the day. If I was really lucky I could find an air-conditioned gas station to spend the afternoon reading, writing, and chatting with the attendant, learning about the local area. On one such occasion a man who owned a service station showed me a photo album of his hunting trips. Among all the shots of himself posing with various dead animals was a photograph of a dead jaguar just like the one I’d seen on the road. Another great feature of the Chaco is its Mennonite communities. Some are traditional, some are modern, all are extremely friendly. I found I could always count on the generous Chaco Mennonites to feed me, let me use their facilities, show me somewhere perfect to throw my tent, and advise me on travel concerns I hadn’t even thought of yet. If you’re heading north into Bolivia along Route 11, stock up on provisions in tiny Mariscal Estigarribia or, better yet, in larger Filadelfia. If you’re coming the other way, from Bolivia, stock up in Villamontes. There’s not a lot in the borderlands between. 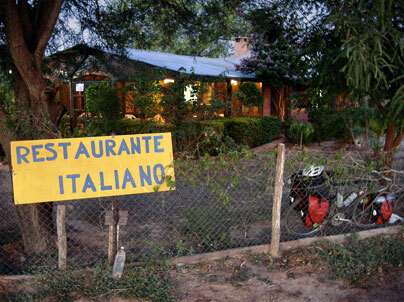 One last thing: Mariscal Estigarribia is the last place you’d expect to find a top-notch Italian restaurant, but if you happen to find yourself in this tiny, isolated frontier hamlet ask around for Maurizio’s Restaurante Italiano and you’ll be treated to the best meal you’ve had in weeks. Maurizio himself is a friendly Swiss-Italian who will even sit and chat with you if you like (after so many days alone in the Chaco, I enjoyed the conversation almost as much as my delicious lomo suizo). 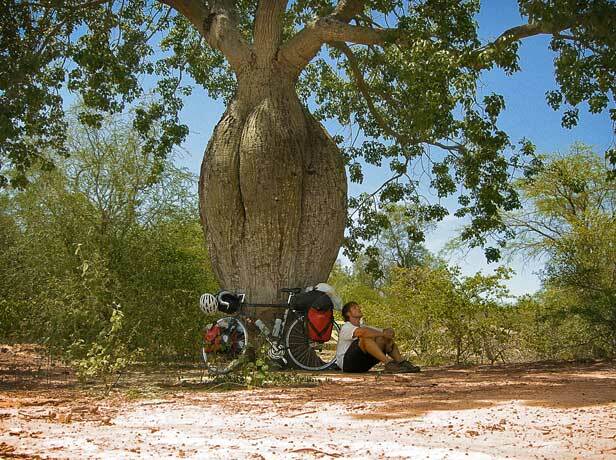 Hiding from the midday heat of the Chaco Seco in the shade of a palo borracho tree. 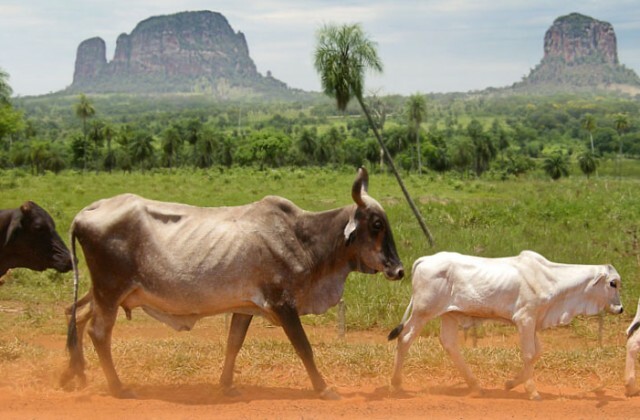 Feature image (top of page): Cow traffic; Cerro Memby in the background.